KITsubs: Kamen Rider Episode 22! Another great character building episode for Ichimonji, as he faces off against Shocker's monster from beneath the sea! 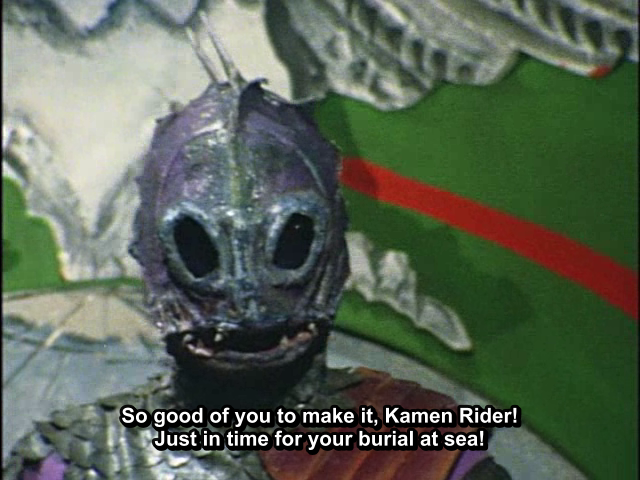 Shocker has a plot that has... something to do with the ocean. I think it was just an excuse for a beach episode. And man, what a beach episode it is. Groovy 70's ladies all over the place! And there's also a machete knife fight, where Ichimonji gets medieval on a bunch of Shocker Grunts! This week, we've got some trivia about the episode from our main translator on this project, Sky79! The young girl is Hiroko Saito. We'll meet her again in ep. 55. She played in other Rider's series too. And I found her in "Barom one" from 1972. With her, one of the main character played Takano Hiroyuki - who also played in Kamen Rider in ep. 18 (starfish monster :D ) the young boy Masaru. In 2002 he narrated the anime version. I do love episode trivia. If anybody has any more info on any other releases, feel free to drop us a line! We'll be sure to credit you on the front page, along with your submission. Sorry we missed our release last week. I (Jeeg) was feeling under the weather, so I decided to take a week off to recuperate. But now I'm feeling much better, and we're back on track with our regularly scheduled releases. And we're still releasing Super-1, as soon as the episodes are finished. Expect the next V2 release to come very soon. Thanks for watching! Gaaaaah, and here I am at college with crap internet! Must download when I get back! Great episode although I can't help wonder what happened to all the OTHER swimmers that Shocker abducted?! Did Taki and his partner blow up the base with them in it? The priest on Taki's wedding was a Shocker cyborg, no? And the nuns were Shocker agents. So doesn't that void Taki's marriage? Kamen Rider Super-1 Episode 03, v2! Kamen Rider Super-1 Episode 02, v2! Kamen Rider Skyrider Episode 21!